I don't recall how it came across my radar, but I picked up the first volume of the manga The Promised Neverland when it came out and I absolutely loved it! 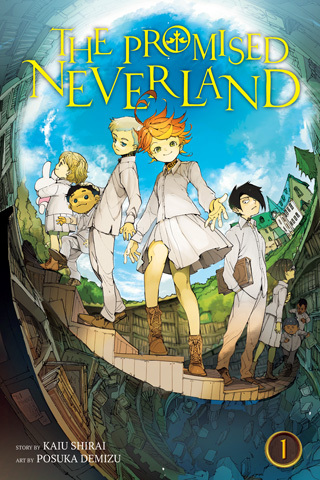 It is the story of an orphanage named the Grace Field House and a young girl named Emma. It captured my attention early on and took an unexpected turn that absolutely had me hooked! I picked up volume two today and might have to review the series in a later post. 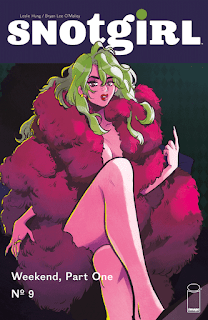 Snotgirl #9 - The premise of a fashion blogger being invited to attend a convention of influencers is not something that would normally capture my interest. I remember when I first started reading Snotgirl I was thinking this is one Bryan Lee O'Malley comic that wasn't for me. I stuck with it and the series took me in a direction that I didn't expect. Nine issues in it is one of my favorite series. In this issue Lottie speaks to a ghost of a fellow influencer who was murdered by someone who is at the convention. In addition to managing her fame, relationships, and helping her friend plan a wedding, she is now tasked with trying to get to the bottom of another mystery. This is a series that is a lot of fun, has a decent amount of snot, and has the same wackiness that you come to expect from Mr. O'Malley. 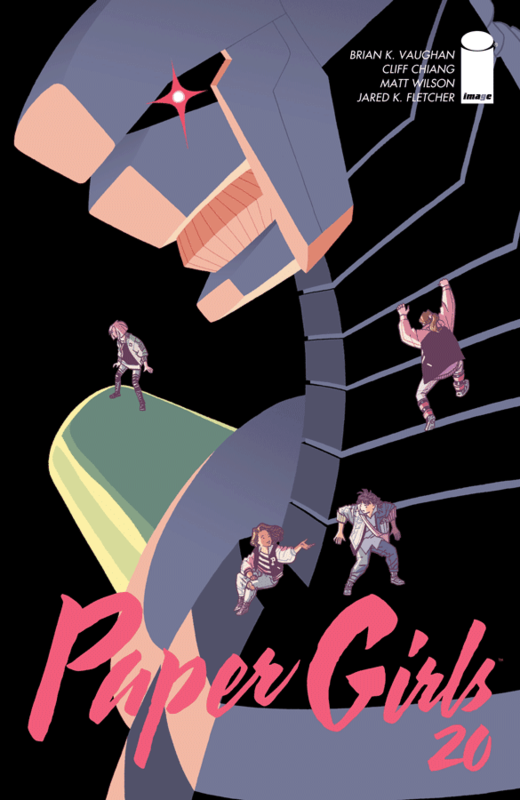 Paper Girls #20 - We learn a little bit more on how the time travel works in this series. People are able to travel through time folds, and depending on the angle you come through you might be able to see different things than others. It explains why the Tiffanies are able to see the robots that can allow them to escape the hellish 2000 and return to 1988. After hi-jacking one of the robots, they quickly attract some negative attention and are still no closer to understanding the true mess they are in. This was one of the more exciting issue, but still has me scratching my head. Daredevil #598 - I shudder thinking about the crimes that Muse has committed. 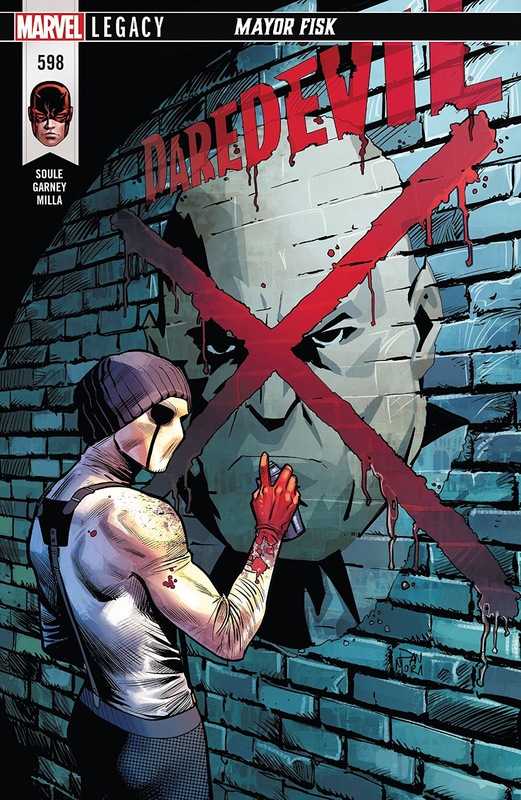 He is a character I didn't know much about until he popped up earlier during Charles Soule's run. Muse escaped from prison in the last year and has been decorating the skyscrapers with massive pictures of various superheros. Meanwhile, Murdock is getting nowhere with Kingpin who is handing out government positions to multiple villains he is in touch with. It does not look like a good time to be living in New York and Soule hinted at twitter he has something shocking planned for the next issue, something even more shocking than the events that occurred at the end of this one. 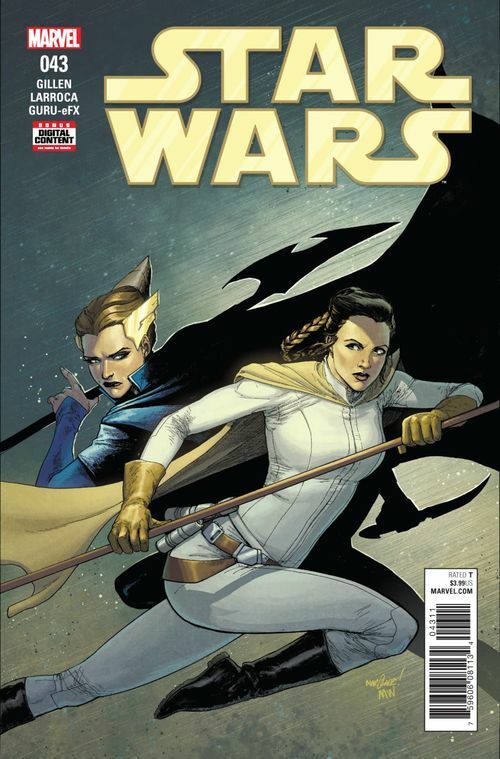 Star Wars #43 - The current arc reaches a satisfying conclusion as Leia is able to actually negotiate an alliance with Queen Trios, who seemed to be working with the Empire. The scene between her and Leia is the best in this issue, with the rest adding up to the equivalent of an epic chase scene as Luke escaped a strong foe and Han led a group to the finish line. It also is worth noting that the villain Luke is squaring off against notes that he would simply equip the clones with flamethrowers in order to combat the Jedi. You can't reflect a flame with a lightsaber like you can a blast from a blaster. Interesting point and curious if it was inspired by the flametroopers we were introduced to in The Force Awakens.